Tom Baxa (1955-1956) - Barefoot Bay Fl. Neal Bicknese (Bick) - (WO DF1 DF60/61 DF63/64) - Casper, Wyo Full Time RV I Wintered over all three times at McMurdo although I Spent the Summer a Byrd station in 63, Married my Wife of 52 Years in Sydney Aust. on the way home from DF1 Met her in CHCH On the way down. John C.Burritt (1958-59) - Fleming Is. 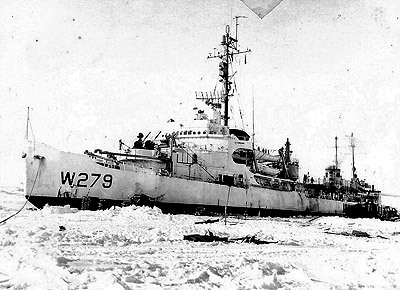 FL I was a Navy helicopter pilot on the USCSC Northwind for Deep Freeze IV in 1958 - 1959. We departed Port Lyttleton, NZ for McMurdo, escorting and cutting channels in the ice for supply ships going to McMurdo. 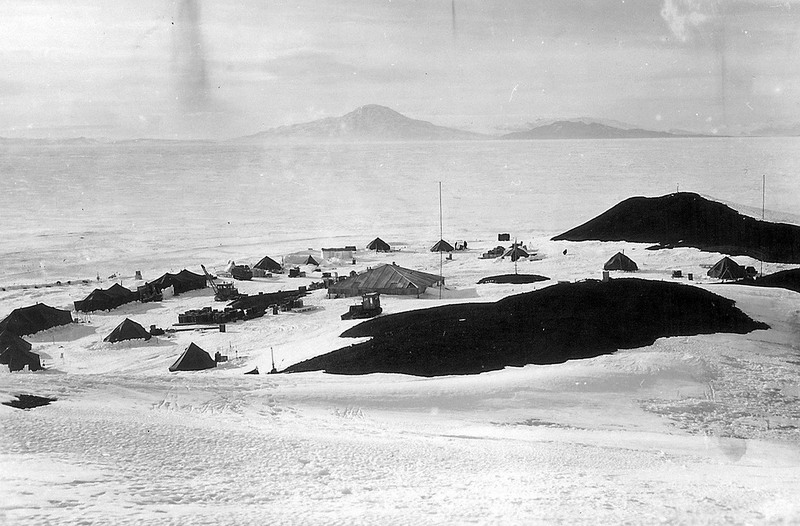 One of the most interesting helo trips was taking Sir Raymond Priestley out to Hut Point to see Shackleton's and Scott's huts. We were able to go into Shackleton's hut. It was like going into a shrine. No one touched anything, we just left our name, outfit, and date on a piece of paper stuck on the wall. We were enthralled with Shackleton's stories of how it had taken him a week dogsleding to get to the hut. He was enthralled with the fact that we covered the same ground by air in about 20 minutes." 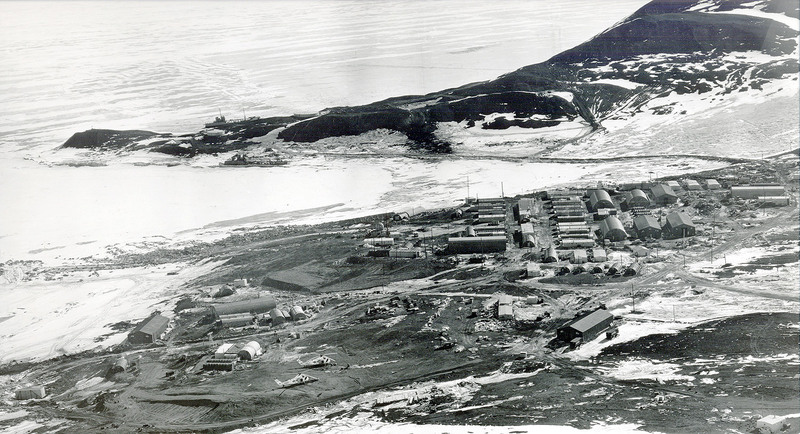 Campbell UD2 (Cape Adare - 1957/58) - Pa Looking for men servicing during DeepFreeze Operation II. I was stationed at Cape Adare and was on the ship Arneb when it was caught in the ice. Roy Cloutier (Operation Deep Freeze Year/s 1961-1962) - Upstate New York Wintered over McMurdo Sound. Was in 1st class hut near the Chapel. Was then transferred to RM Advanced School in Bainbridge Maryland. Worked at the Radio center up the hill below the transmitter location. I just watched a new movie out about Antarctica. 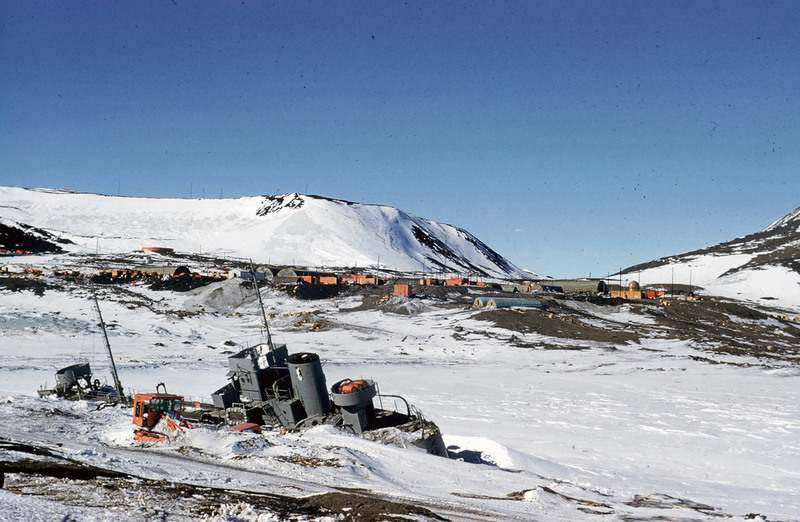 Could not believe the buildings and McMurdo Station? What happened to the Quonset Huts we lived in? It sure brought back many memories..
Gregory P Dowd (VX 6 Det Little America V, 1957-1958) - Easton USA - Deepfreeze III, wintered over. Flew the Otter and the R4d-5. Assigned as squadron photo officer. Bill Fisher - McMurdo (1957-58) - Kalamazoo, Mi A great year to winter over. I was US Navy Radioman. Vivian (Bunny) Fuchs was knighted for his Antarctic crossing and I believe Sir Edmund Hillary presented Her Majesty's knighthood to him (flew in from Christchurch, did not winter over. My big, big boss was USN Admiral Dufeck. Turned 21 yrs while there. I was responsible for "cutting" teletype tapes for transmission later. I sincerely apologize to Sir Vivian Fuchs and ADM Dufeck for any typo's. Bill Miles (1963) - Woods Cross Utah - Operation Deep Freeze I believe He (Bill Miles, my half uncle) was with Admiral Byrd's second expedition to the South Pole. Thomas J. Stearns (Deep Freeze 1968) - Cleveland, Mn. 56017 Hut mates were: Downs, Holland, Bostwick, Cloer, Keilty, Konkel, McIntyre, Pogue, Rudloff, Simonton, Thomas, Wade, Meyer, Powell, Hanson & Fine. David Sweet (USS Arneb AKA-56, 59-60, 60-61) - The Villages FL. As an 18 year old kid, I joined the Navy to see the world....and I did! Ron Tisue (1959) - Cincinnati, Ohio Interested in finding others who were wintering over during Operation Deep Freeze IV. 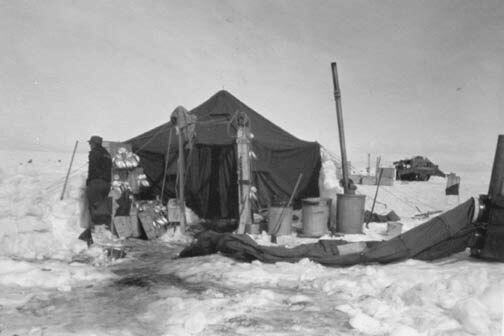 The kitchen "tent" at McMurdo in 1955 where the food was prepared for our crew that was constructing the base during Deep Freeze 1. Everyone ate outside sitting on crates etc. during the initial stages. I slept in a tent near to Scott's Hut Point building. 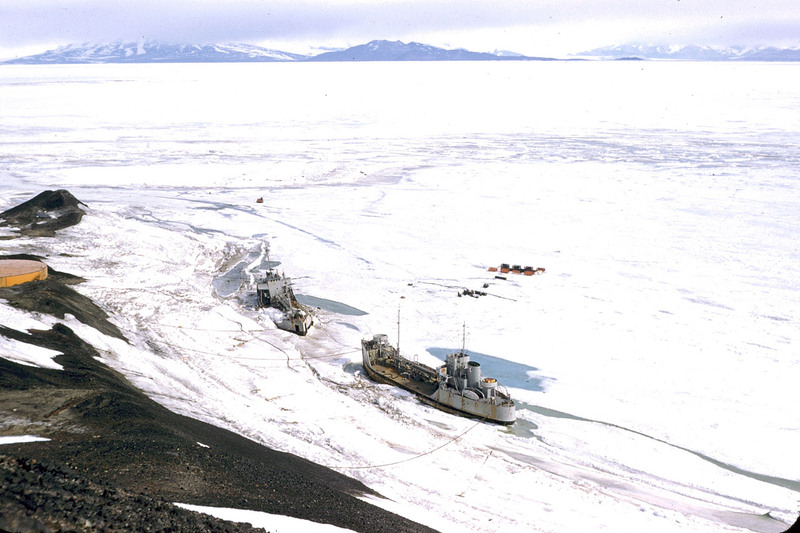 1960 - oiler ship frozen into the sea ice. 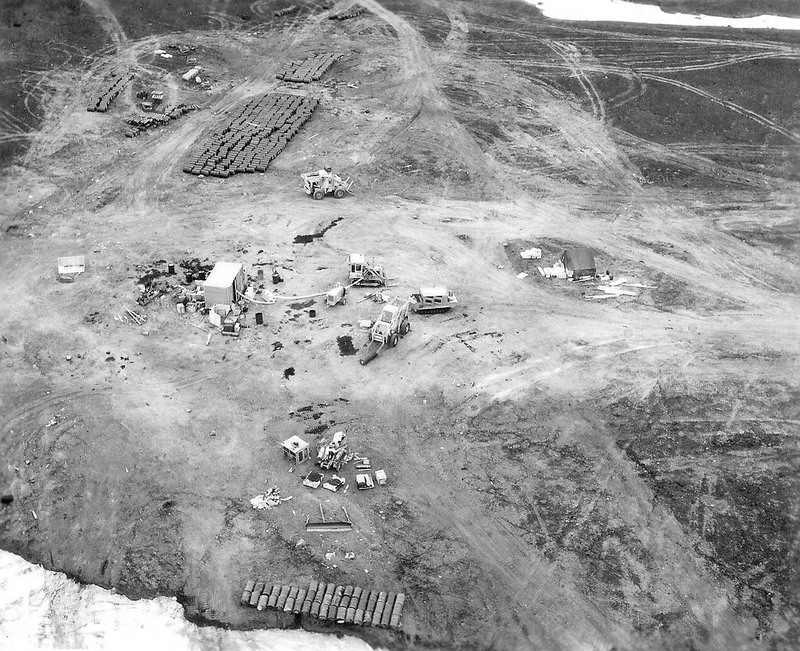 Aerial view looking Southerly toward McMurdo Base that was being constructed at the base of Mt. Discovery during Deep Freeze 1 about Dec. 1955 . 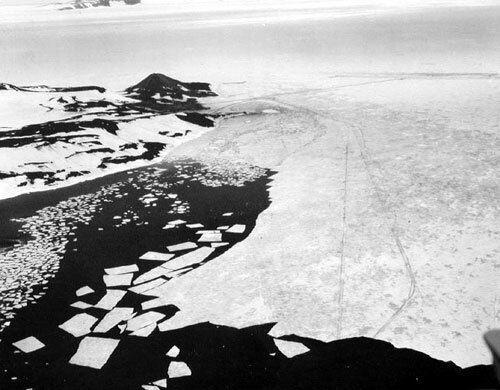 The faint dark triangle from the ice edge is the two tractor trails that led from the cargo ships to the base. The air strip runway is to far right near top of picture. Trying to find... To use this option, fill in the registration form, but include your own name and email as a contact, requests kept online approx. 2 years. I'm sure I did this already... every now and then I send out emails, a proportion of these bounce back as "not found", often because it was a former work email or an ISP that no longer exists, as there is no longer any way to make contact I delete the record to keep things as current as I can. Trying to find... Can you help?